When it comes to over-the-top alternatives to buying Super Bowl ad time, Skittles seems to be the one to beat. Last year, the colorful Mars candy brand and DDB created “the most exclusive Super Bowl ad ever” — an ad, starring David Schwimmer, that was shown to only one person on Super Bowl day: Marcos Menendez, a teen fan from California. That effort, amply teased prior to game day, reportedly generated some 1.5 billion earned media impressions, and won the brand a slew of awards, including multiple Cannes Lions. This year, the brand and DDB are producing a one-performance-only Broadway musical, to open and close on Super Bowl Sunday, Feb.3. 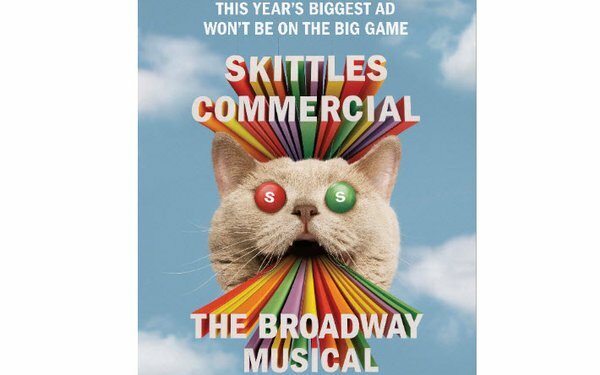 “Skittles Commercial: The Broadway Musical” will feature a “soon-to-announced” celebrity, a 17-member cast, and original songs backed by a live band, according to the brand. The content must be pretty edgy: The show’s website states that “attendance for those under 13 is highly discouraged,” and anyone under that age must be accompanied by an adult. The show will take place at 1 pm EST on Super Bowl Sunday at The Town Hall (23 W. 43rd St.) in New York City, and close forever after its 30-minute run. Skittles is selling the 1,500 available tickets on Ticketmaster, at prices ranging from $30 to $205. The proceeds will be donated to the national nonprofit Broadway Cares/Equity Fights AIDS. Mars Wrigley will also donate an amount equal to the ticket sales, up to a maximum of $50,000. Skittles will use its Facebook, Twitter and Instagram pages, as well as the musical’s site, to reveal more about the show during the days leading up to Feb. 3. However, the brand stated that it won’t record the show to air it at a future date. Skittles ran ads during the 2015, 2016 and 2017 Super Bowl games.